Last week I began by relating how I was deliciously vindicated in front of my 4th grade class over a test I had presumably failed and everyone else passed. It was a moment I obviously (much to my shame) still cherish! Let me take you back to around that same period for another experience in my oft misspent youth. Many of you know I have an older brother – Ken. And as older brothers are wont to do, he picked on me, played practical jokes on me etc. – the usual sibling stuff. Kenny also had a habit in those days, when we took car rides. He liked to have his head out the window. Once, in a need to get him back over some real or perceived slight, it dawned on me that with his head out the window, pressing the “up” button on the power window might have an interesting effect. At first, Kenny thought it was kind of funny too. Until his head got stuck. He in his panic couldn’t push the down button and me, in my delight, WOULDN’T push the down button. This too was delicious, and well worth the spanking I received later. I had had my vengeance. And it felt good. Sinful though it was. The theme of chapter 18 we saw, is the Saint’s right, just and holy VINDICATION for our rejection of Babylon’s worldview and values. That as Christians we do not seek personal autonomy but the Lordship of Jesus; we refuse to seek our well-being and security in material wealth but rather in the riches of Christ; we take our understanding of true spirituality from the Scriptures instead of inventing our own; and we repudiate the Culture’s morality in favor of Biblical holiness empowered by the Spirit. Those who have lived as citizens of Christ’s Kingdom to come, will be fully vindicated in that day. For we know him who said, “Vengeance is mine; I will repay.” And again, “The Lord will judge his people.” It is a fearful thing to fall into the hands of the living God. In the end – those who call themselves Christians, but by adopting the World’s values are indistinguishable from the World, will be judged WITH the World, with Babylon. Thus the compromising Church is called Babylon as well. And so as we examined the dirges, the funeral songs sung by the World as it watched Babylon being destroyed – today, we make a most important turn in the book as a whole. The entire tenor of the book changes here to begin fixing the Believer’s attention, heart and mind on the glories to come in Christ. We move from 2 dirges to 3 hymns. And those 3 in a crescendo that is magnificent. “After this” simply refers to after witnessing the destruction of Babylon. Hallelujah being a Hebrew word picked up from the Psalms and appearing only here in the whole of the New Testament. Literally it means: Praise Yahweh – the name God gave to the Israelites to know and call Him by. “I am that I am” – the ever existing one. Praise God! They cry. He is the God who saves – who alone saves. He is the God who is glorious in His saving work. He is the God who is all powerful – for it takes an omnipotent God both to redeem the lost unto salvation in Christ Jesus and to bring an end not just to sinners – but to sin, to sinfulness itself. We’ll come back to that thought for it is essential for understanding God’s vengeance as opposed to fallen man’s notions of revenge. Hallelujah indeed. But more. His judgments are true – accurate. He neither imputes too little nor too much guilt in His assessments. We, are all too prone to minimize our own sins and magnify other’s – But His judgments are true. And, they are just. No one is ever under punished, and no one is ever over punished. God is a just God and cannot do otherwise. So in His truth and justice He has rightly judged the Great Prostitute, that world system called Babylon which seeks to lure men and women into its values and mindset versus pure allegiance to the God who made us – and judged the compromising Church which made serving the World’s values seem reasonable, right and good – compatible with serving Christ. The Church, those Christians, who sought to gain what the World has to give, and its acceptance, by compromising with it in materialism, autonomy, morality and supposed spirituality. And thus He has avenged on her the blood of His servants. And let’s pause right here to tease out the nature of God’s vengeance. Note that it is not a vengeance upon people here, but upon Babylon, the system, the mindset, the worldview. As Mounce notes – Babylon has always been symbolic of opposition to the advance of the kingdom of God. Now this is vitally important. If God only poured out His judgment upon the people – sinners as sinners – which He does do, but if He only did that – the greater sin problem would remain unsolved. On our behalf, God judges and destroys the entire construct that lures us away from fidelity to Him. He destroys the entire system that obscures the truth about His nature and character and salvation itself. He crushes that which continually and ubiquitously tempts us with all forms of sin and unbelief. Which makes the World and what it offers seem so inviting, satisfying and worth forsaking Christ for. In bringing His kingdom to pass He must take us utterly out of an atmosphere which caters to fallen human lusts, and that creates a reality which exchanges the truth of God’s Word for lies the Devil perpetrated on the whole of mankind since the Fall. Of making God suspect, not loving, not to be trusted, of being obtuse, unreasonable and having hidden, nefarious motives so that we must look out for ourselves even against Him. For see what earnestness this godly grief has produced in you, but also what eagerness to clear yourselves, what indignation, what fear, what longing, what zeal, what punishment! At every point you have proved yourselves innocent in the matter. So although I wrote to you, it was not for the sake of the one who did the wrong, nor for the sake of the one who suffered the wrong, but in order that your earnestness for us might be revealed to you in the sight of God. In this passage we get a look at what genuine, New Testament repentance looks like. Unlike the current notions among many that repentance is just feeling bad or saying one is sorry for their sin, notice the components of Biblical repentance. There is an earnestness to deal with sins, not a cavalier or blase attitude. Not a “can we just move on?” – instant fix-it approach. There is eagerness to clear oneself – a sense of being soiled by their sin and needing to be washed of the filth and stain of it. There is indignation at self. As a child of God, this is beneath me and I am ashamed. Fear – disturbed that they can still depart from righteousness so easily rather than an “oh well, nobody’s perfect” attitude. Longing to be free at last from the principle of indwelling sin, not just the immediate action. Zeal to do whatever it takes to make things right. Punishment! In the Greek – our word here for vengeance. The very same word used in the Revelation text. A commitment to take vengeance on my own sinfulness. You see it moves beyond dealing with a mere action or infraction to wrestling with the inner dynamics of sinfulness itself. Do you see it? One hasn’t repented from the sin of theft when they simply stop stealing. They haven’t repented until their mindset has changed and they not only do not steal, but labor honestly instead – AND become generous to others! We cannot explore it now, but this dynamic of taking vengeance on our sins is very often the missing key in dealing with besetting sin. We just want done with it. But true repentance wants revenge on it! God in judging Babylon and avenging His servants does not simply do away with sinners, He deals with sin, with sinfulness itself. He destroys the very mindset of the World we’ve imbibed AND the inward principle that leads to sin. Heaven will not be Heaven until Believers bear the image of Christ fully, and in His character, love holiness and hate sin as naturally and perfectly as He does. To be perfectly honest, it is of little consequence to me that God should ever repay anyone for any sin they might have committed against me in this life. God forbid! Let me learn to pray always – Father, forgive us, forgive me MY sins, even AS I have forgiven others. Teach me to avenge my un-forgiveness. Revenge on others is grotesque and sinful in light of how He has cleansed my sin in the blood of His own Dear Son Jesus. No, I want vengeance on how this world lied to me about who I am – a random assemblage of molecular accidents – instead of created in His image. How it robbed me of knowing true eternal purpose by training my eyes to look to this world and to myself as supreme. How Satan’s lies led my first parents into thinking God was against them, egocentric and dark in prohibiting the fruit of the Tree of the knowledge of good and evil. And how the remaining echo of that that still makes God suspect in my heart at times. I want vengeance on the World that catered to my fallen lusts to make me live for self instead of Him, and that tried to blind me to the Gospel and the truth of His Word. That encouraged me to sin and destroy my own soul and heart and mind in the process. I want vengeance on my own indwelling sinfulness, faithlessness, unfaithfulness and impurity – all fostered and catered to by the World. I want to be avenged of these wrongs! And this hymn tells me it is so. It is at this point that even the 24 elders and the 4 living creatures we saw back in ch. 4 – indeed, the very throne room of God at this moment convulses, erupts, responds with a resounding – cosmic and heavenly YES! Amen! they shout – so be it. And we add our Hallelujah – praise to Yahweh. Rev. 19:5 At which affirmation there comes out of the very midst of the throne itself -perhaps the voice of the Holy Spirit calling all of creation to join in the singing. Rev. 19:6-8 Which then gives way to our 3rd hymn – and with an increased participation in response to the Spirit’s call. Oh what a scene this is. 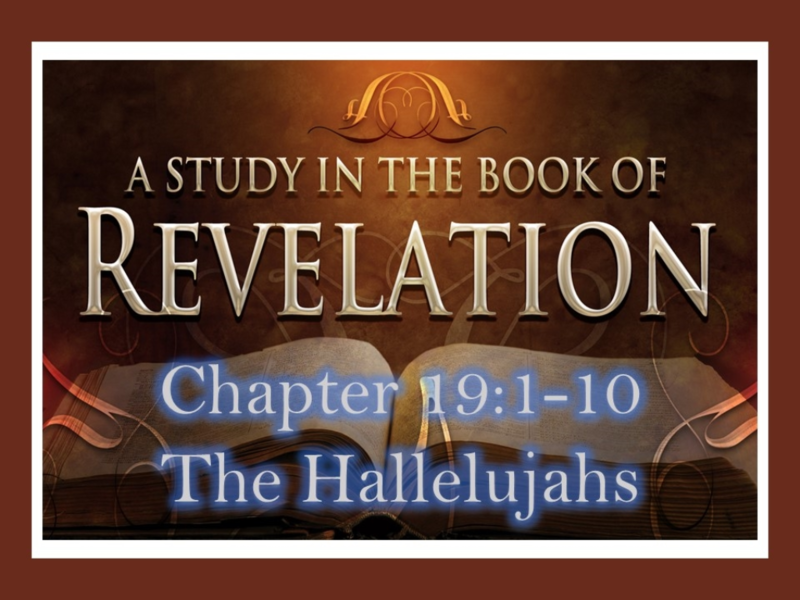 Loud and massive – like the roar of many waters – the same term used for the voice of the glorified Jesus in 1:15; as though to say that now His voice and the voices of His redeemed are one in some way – and in unison all cry out HALLELUJAH! Why is God to be so praised now? There are 3 reasons in the text. Because now that Babylon is fallen, Jesus reigns uncontested. He has always reigned since His ascension, but now, all opposition is gone. Because the marriage of the Lamb has come at last. The consummation of all that we as Christians hope and long for, and that Jesus died for – finally reaches its apex: The Believers joined to Christ as His bride in unspeakable and eternally unbreakable intimacy and unity and joy. Hallelujah indeed! A union with Him that we will never grow tired of, perpetually cherish, and enjoy in ever increasing waves of unending pleasure and perfection. Because the Bride’s readiness – OUR readiness if you are in Christ here today – is found in His grant to us of fine linen, bright and pure – which also symbolizes the righteous deeds we’ve done. Note: While our righteous deeds are symbolized as this fine linen, bright and pure – it is clothing that is “granted” to us. Unearned. Bestowed. What can that mean? How can both be true? Is it our righteous deeds, or is it something He has given us? The mixed language may mean that once we reach Heaven, we will realize that all the good things we have done, have been done out of the working of His Spirit within us. In fact I am fairly certain that is at least part of what is meant here. But if I can take you back to another portion of Scripture we had read this morning – we might get still more insight. Matt. 25:37-40 The key is found in 37-40. Listen child of God, this is beyond sweet. The simplest and most faltering of actions done by His beloved children, even unknowingly, are received by Him and rewarded by Him, simply because we are His. It is not their magnitude. It is not their perfection. It is not their number. It is that they are ours – and we are His by virtue of His saving grace . Beloved, He will not forget your weakest, poorest, most pitiful acts – because you are His. And these paltry offerings of obedience and even unconscious acting out of your renewed nature will be the very fabric whereby you are clothed and made ready to be married to the King of Kings and Lord of Lords. At the revelation of all of this, at the blessedness of who we are and our being brought at last to dine with our King at our own marriage supper – and, of the angel’s affirmation that this is TRUE – as unbelievable as it seems: John is so overwhelmed, he forgets himself falls down at the angel’s feet to worship him. The angel helps John regain himself and reminds him that the angels are fellow servants of God, even as John and we all are who hold to the testimony of Jesus – and says: Worship God. Give Him the hallelujah. And then he says the most astounding thing: Do you want to know the key to unlock all of Scripture and its prophecies? The wonder, the fullness, the majesty, power and fullest revelation of God, His person, nature character and works is all found here – in the testimony of Jesus Christ. Beloved – let no person, no system, no notion ever have a moment’s purchase in your heart and mind regarding things spiritual, eternal and the sum of truth, if it does not give full glory to Jesus Christ as the incarnate Son of God, dying His substitutionary, atoning death on the cross, bearing the wrath of God on our behalf, that all who trust in Him alone might be reconciled to the Father, born again, and have eternal life with Him when He comes again to vanquish all sin, and make us His eternal bride. Hallelujah! For vengeance on Babylon. Hallelujah! For our being made a fit Bride for the very Son of God. Hallelujah! For the final fulfillment of all of His promises.